Imagine you are the ghost of some poor, murdered individual and are eternally trapped in a spooky mansion. One grim Halloween night, you are joined in your abode by a number of mediums. Much to your delight, these mediums are striving to understand the specifics of your untimely demise- who killed you, in which room you were murdered, and with what object. Much to your chagrin, you soon realize that you can’t communicate to your psychic pals directly- instead, you can only send them vague visions. Every hour when the clock chimes, you are able to send each medium a series of visions. If they can’t deduce the details of your death by the end of the night, you won’t have another chance until next Halloween. Will your eternal soul be put to rest? There’s plenty of deducing to do! 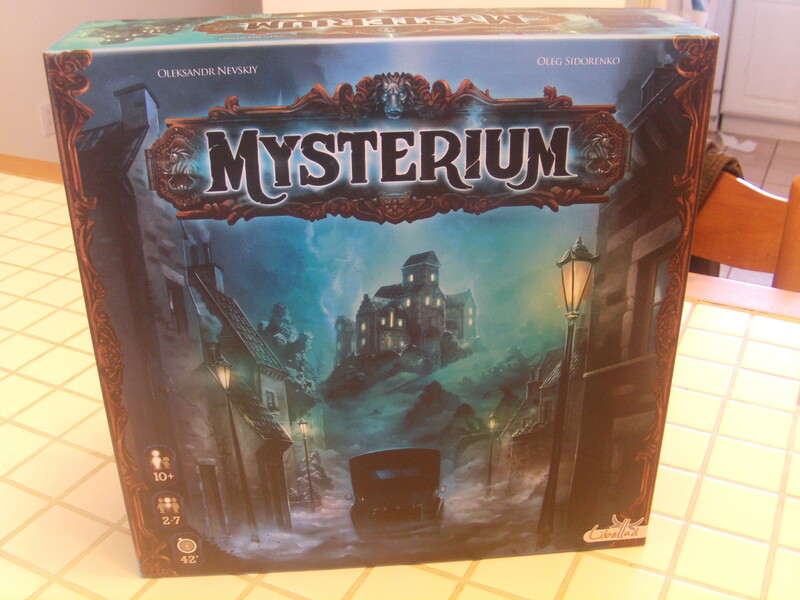 Mysterium is a game of deduction published by Asmodee for 2-7 players with games lasting roughly an hour. 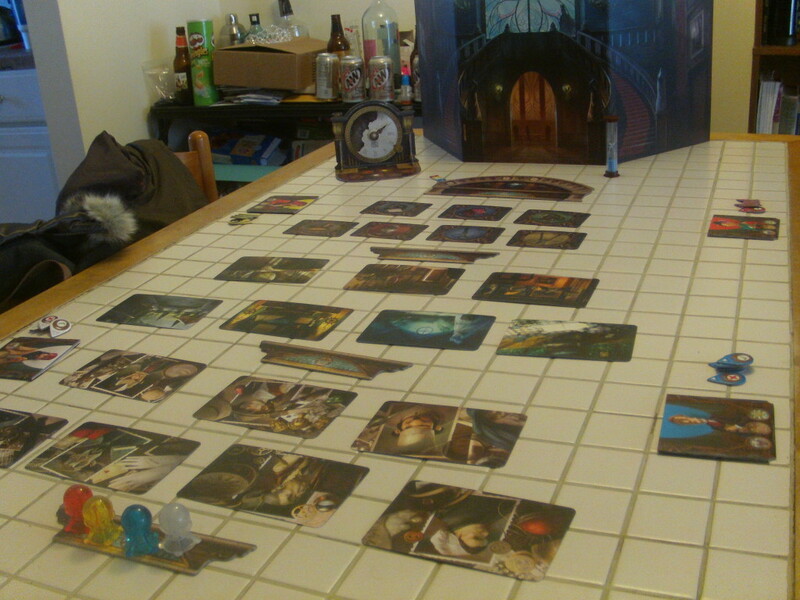 In each game, one player will take on the role of the ghost, with all other players being the mediums. Each medium will unknowingly be assigned a suspect, location and murder weapon. Each round (or hour on a clock) the ghost will pass one or more vision cards to each medium in an attempt to communicate to them a fact about their death. Each fact is determined in the order of suspect, location and weapon. If a medium correctly deduces the fact, then the next turn, they will move on to the next fact. However, if they fail, the next round they will try again with the help of additional visions passed to them by the ghost. 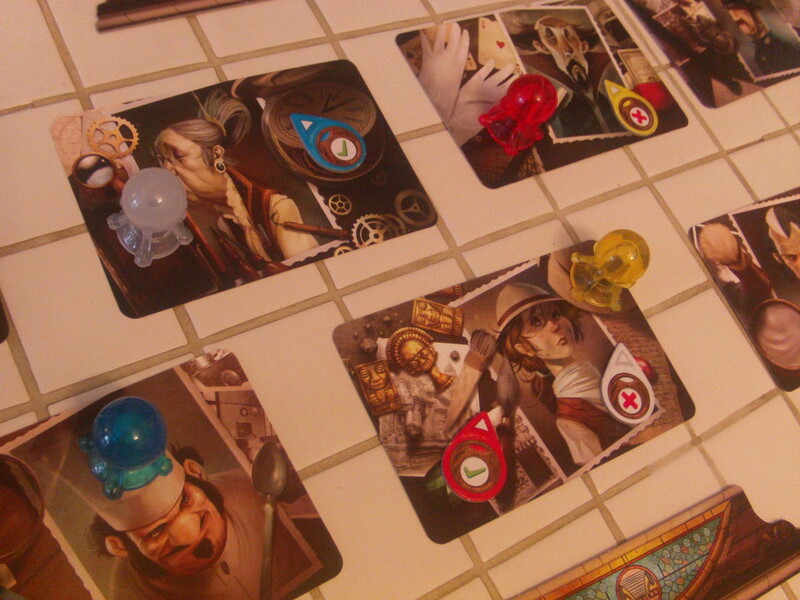 If the mediums can each deduce their assigned suspect, location and weapon before the last round of the game, then there is a final round in which the ghost tries to communicate (through the use of a last set of visions) which set of suspect, location, and weapon is the correct set. If the mediums deduce this one correctly (through a majority vote) then everyone at the table wins! 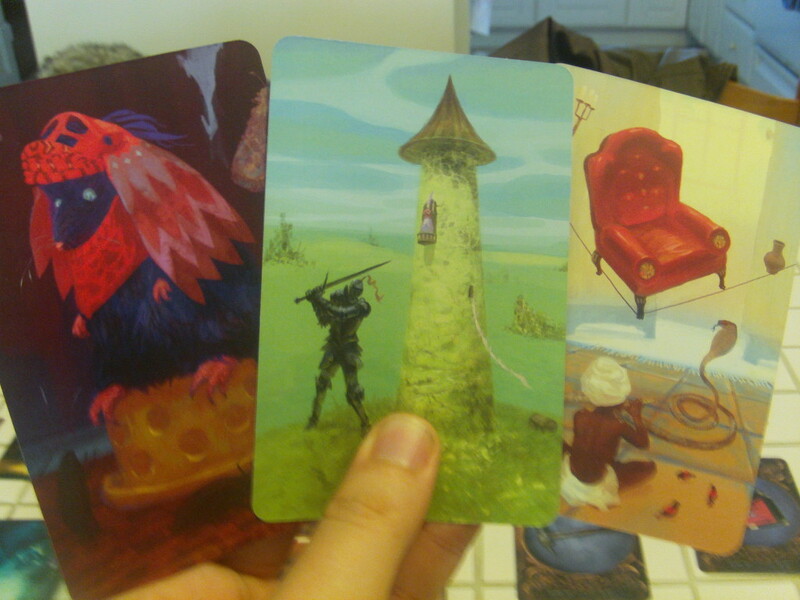 The meat of this game are the vision cards- each one is a vague, unsettling, artistic dreamscape that could be interpreted any number of ways. If you are the ghost, you’ll be tempted to give a psychic as many cards as you can in order to better get your point across- but with every vision, the point you are trying to make becomes harder and harder to discern. This is both the most maddeningly frustrating aspect of this game, along with the most satisfying? Why? Because if you are the ghost, you are not allowed to speak during the course of the game. You’ll sit there behind a large player screen, and watch and listen as your friends hotly debate the meaning of the vague visions you’ve sent them. You may even hear one of the psychics correctly deduce the jist of your vision, only to be convinced by another psychic that they have no idea what they’re talking about. And while this is frustrating, it is also highly entertaining. However, it does highlight what is possibly a large flaw in this otherwise delightful game. The successful communication between the ghost and psychics greatly depends on how well they know each other (and more importantly, how they think.) A ghost and psychic who have known each other for a decade will probably be able to communicate much more easily than two people who only just met. 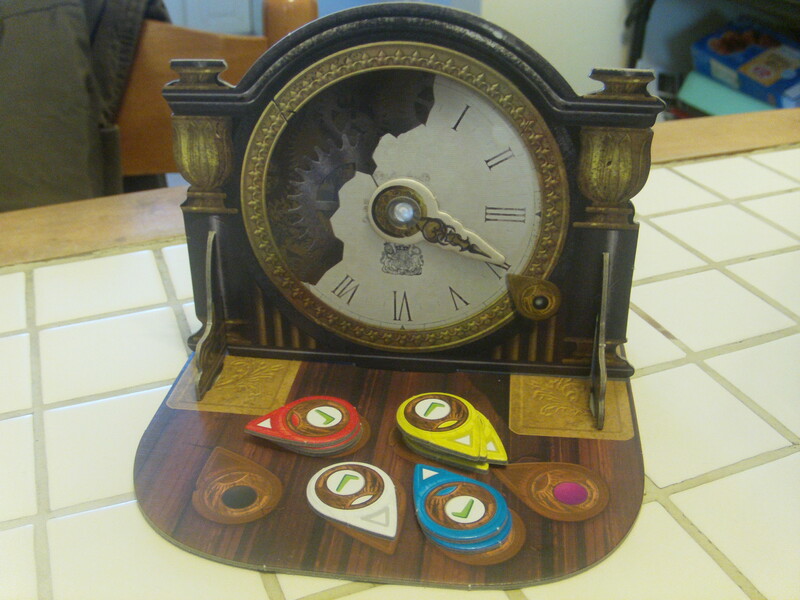 This is why that although at times Mysterium may have the feel of a casual party game, breaking it out at a party with people who are meeting for the first time may turn into a rather frustrating experience. This is mitigated, however, by the fact that any psychic who correctly deduces all three of their facts before the other psychics is allowed to then help them in deducing their own facts.